CSX #368 exiting Bear Pen Gap Tunnel headed to the new wood chip facility. 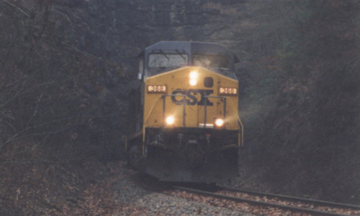 The Fremont Branch is located at Caney Junction, just north of McClure, VA. Caney Junction (MP 22.9) is were the Fremont Branch leaves the mainline and enters the 14.5 mile branch line. The Fremont Branch had 8 tipples at one time or another with the huge Moss #1 Mine / Preparation Plant at the end of the Fremont Branch. Located at milepost F- 2.7 is Holly Creek Tipple. Located at milepost F- 3.0 is Dickenson Tipple. Just over river bridge is Cranes Nest siding. Milepost F- 8.9 looking west at Mullins Tipple. Looking at Mullins it was a unique tipple. Close up view of the Mullins loader & conveyors. Delp was a tipple that you never knew went it would be operating, and for the longest time it was for sale. It was a simple tipple with a truck dump seen in this photo. Delp even had an office complete with truck scale as well. Victor Tipple at milepost F- 11.1 was a small truck dump operation. Another view of Victor looking at the truck dump side. Phipps located at milepost F- 12.0 is a newer tipple that has since been removed sometime before 2004. Moss #1 Mine at the end of the Fremont Branch, photo was taken May '96. Moss Mine had two adjacent mine heads along with a deep shaft mine directly under the plant. About the only other structure left was the silo.